The University of Pennsylvania and Dr. Martin E.P. Seligman joined hands and created a ‘Foundations of Positive Psychology’ course. The five interactive and engaging online modules will provide you with key theories and research in the field of Positive Psychology. Topics as human flourishing, resilience, and grit will pass the review. The modules are taught by leading researchers and practitioners, including the “father of Positive Psychology”, Dr. Marin E.P. Seligman and his outstanding colleagues: Dr. James Pawelski, Dr. Angela Duckworth, Dr. Claire Robertson-Kraft and Dr. Karen Reivich. After completing all five courses, you will receive a signed certificate. “This specialization teaches learners that human beings can have more happiness now than they do, more engagement at work and with the people they love, more meaning in their lives and more positive accomplishment.” (Dr. Martin E.P. Seligman). ‘Positive Psychology: Martin E.P. Seligman’s Visionary Science’ with Dr. Martin E.P. Seligman. In this course, the scientific foundations of Positive Psychology are being introduced. Seligman will teach you the science of well-being and flourishing. You will also be educated about future developments in the field. ‘Positive Psychology: Applications and Interventions’ with Dr. James O. Pawelski: this course explores positive interventions through theory, research, and practice. 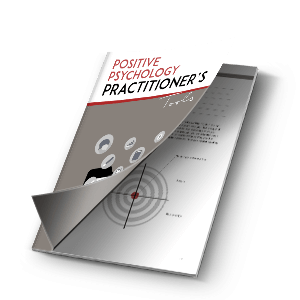 Additionally, you are taught how to use Positive Psychology in professional and personal contexts. 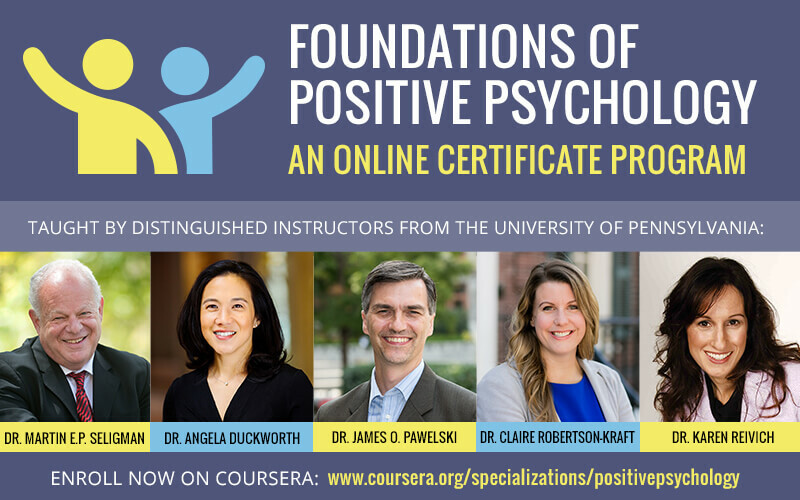 ‘Positive Psychology: Grit, Character and Research Methods’ with Dr. Angela Duckworth & Dr. Claire Robertson-Kraft: This course teaches you how to apply research methods in your own Positive Psychology study. ‘Positive Psychology: Resilience Skills’ with Dr. Karen Reivich: In this course, you will learn how to apply resilience interventions to your professional and personal life. Questions as ‘what is resilience’ and ‘how can you increase your resilience’ will be answered. ‘Positive Psychology Specialization Project’ with Dr. Martin E.P. Seligman: This course brings together the key concepts from the first four courses as you develop a new intervention that you can hereafter put into action. After completing Foundations of Positive Psychology Specialization you will be able to describe the past, present, and future of the science of the field and you will also have gained experience in how to read positive psychology research critically. Most importantly, you will learn how to improve your well-being by using intervention strategies. Each course is four modules/weeks long and takes 2-7 hours to complete. It’s a self-paced course once the sessions begin: each course starts every two weeks on Mondays. You do not need a specific background to complete the course. For more information and enrolment, please visit the ‘Foundations of Positive Psychology’ page. What is the cost of the programme? Are there any concessions for semior ctizens? I hereby apply for a free certificate course on psychology. I see that one person commented that the course is 79.00 a month. How many months is the course to get the certificate? Oh, I just found the answer. Sorry about that. The website says that the costs for this program are $4300 per person. Does this course provide CEU’s? What is the name of the School or Organization responsible for the course? I am taking the program through Coursera (and I don’t know if that is the only source). The cost is $79/month with a free trial week. I am almost through with the first course and am learning a lot. The material is very good and the technology interface is pretty intuitive. The only shortcoming that I find is that the narrative script which accompanies each lesson appears to have been computer generated without benefit of a careful human reading. Mythology becomes methodology; and disease becomes deceased. It isn’t terrible, but it could be better. Is this a recognised certificate in Australia? After completion, you will receive a signed certificate. However, the course cannot be found in the approved programs of study database by the AHRPA. Hello, Can i know the cost of the course pleas?